Fantasy Draft rankings by position by our team of experts. 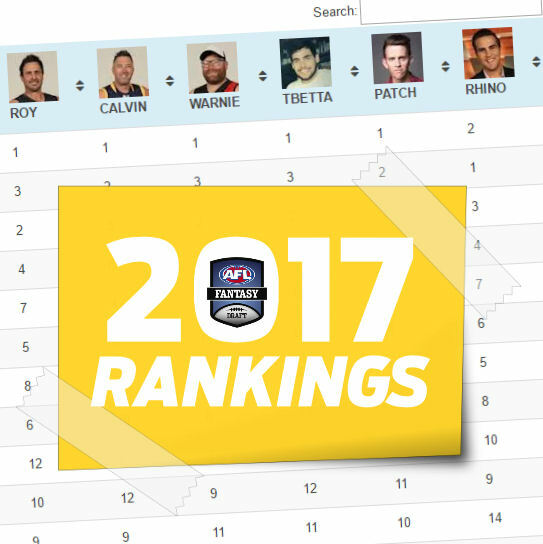 The 2017 AFL Fantasy Draft Rankings compiled by Roy, Calvin and Warnie with the help of some of their draft guru friends – Tbetta, Patch and Footy Rhino. These rankings – by position – aim to help you for your leagues on Draft Day. Each contributor was asked to rank their top 80 defenders, 100 midfielders, 24 rucks and 80 forwards for Draft. These have been sorted as a ‘site average’ using everyone’s picks. We do aim to update this in early March after watching some JLT Community Series and so it is closer to when most people will be drafting. If viewing on mobile, you should be able to see the site rankings just fine. We recommend using a desktop to get all of the info that you need. To get back to the Draft Rankings page at any time, there is a link in the top menu on the site. Alex Trombetta – aka Tbetta – No stranger to followers of DT Talk. An absolute guru when it comes to Fantasy footy… and Tinder. Has been playing many forms of the draft game across different sports with NBA being a huge one for his group of mates. Hit him up on Twitter: @tbetta9. Damon Adams – aka Patch – Recently appointed editor of Footy Prophet, he’s been a champion Fantasy coach across all formats but most notably he is a member of the biggest draft league in the country, the DT Shiva. Patch is a member of Div 1. Follow on Twitter: @DT_Adams_. Ryan Daniels – aka Footy Rhino – Probably the biggest name in Fantasy footy in Australia and the man behind the awesome Footy Rhino website and podcast. Although currently on hiatus, the Channel 7 reporter from Perth will still be winning plenty of Draft premierships. Get the good oil on Twitter: @FootyRhino. LAST UPDATED: 12 February, 2017. (Click for rankings by position). Picked my exact midfield top 6 with my only omission being Neale. A wonderful resource for draft league fanatics like myself – close to the best thing I’ve read in years on DTTalk. Many thanks, fellas. Rory sloane or tom Mitchell? For your draft team? Check out the rankings. (Although I do know what you’re after, head long to My Team for help on player choices). Is there some resource for smokies / sliders? Fantastic resource. Had printed out all the rankings and was going to put it all on Excel but you have saved me the time. See every pick of the draft held this afternoon.